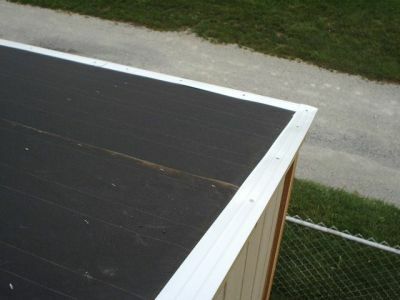 Do you really need drip edge on your shed roof? As a professional shed builder, I can tell you that it is worth the extra cost to use drip edge and roofing felt paper on your shed! Should you use drip edge? It's just a shed! If you live in a climate like I do, where the winters are somewhat harsh, then mild, then harsh again, with alot of freezing, thawing, raining, snow, etc., then having drip edge installed on your shed roof over the roofing felt is an absolute must in my book. Water is woods worst enemy. I say this because roof sheeting if protected properly, will last longer then if it isn't. Do you really want to sink a thousand dollars and more into building a shed, then not add drip edging, and watch your roof edges rot? Give it some time, and I guarantee you that you'll be replacing your shed roof, or building a new shed because the type of damage that can occur by not using drip edge and roofing felt will also cause interior damage to your shed. Water will work its way back up under the edge of your shingles, however, with drip edge properly installed on your shed roof, this damaging water will be re-routed to drop vertically to the ground or gutter instead of permeating into your roof sheeting. Drip edge usually comes in black, brown, white, or silver colors. Lengths are usually 10', and not very expensive at all. So, building your shed and building it well means using drip edge and roofing felt. 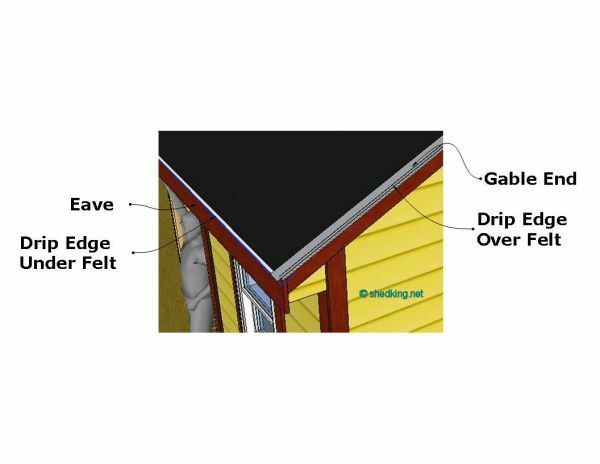 Here's the right way to install drip edge on your shed roof. More info on building your shed roof.